A medium-sized sparrow with a rounded head, pink beak and dark eyes. Upperparts can be grey, slate-grey or brown, while its belly and the outer feathers of its long, fan-shaped tail are always white. Dark-eyed juncos can be seen hopping along the ground in coniferous and mixed forests, and breed or live year-round in every province and territory in Canada. When we first started feeding birds in our backyard two winters ago, the dark-eyed Junco was the first bird visitor I'd never seen before. This unassumingly lovely bird made me pay closer attention. Out where I'd scattered sunflower seeds after the first snowfall, sitting slightly apart from the brown cluster of house sparrows and finches, was a bird with a grey-black head and back, hopping along the ground, flakes of snow clustered on its white belly. I was excited to quickly find the Junco on my flyer of common winter visitors to backyard feeders: this was the first new backyard bird I identified. We are barely 15 metres from Queen St. west, but we were getting lovely visitors thanks to a tiny yard full of berry-laden vines and bushes. With every fresh snowfall, the gorgeous dark-eyed Juncos would appear dotted against the white, untroubled by the snowy ground as the house sparrows huddled along the fence. I fell in love with the Juncos dark grey fading to white "ombré" coats against the snow. I'm also seduced by the literariness of the name, those "dark-eyed" handsome visitors at our back door. So even though we get house finches with brilliant red-dipped heads and white-crowned sparrows, and a gorgeous cardinal pair, and we've had visits from redpolls and black-capped (and occasionally tiny boreal) chickadees, and often see (but more often hear) the resident Northern Mockingbird next door; even though I've seen a kestrel pause in our apple tree, and a sharp-shinned hawk rest on top of the light post scanning for mice in the alley, I still love me those handsome dark-eyed Juncos, and cheer their winter visit. They arrive with the snow, and make winter something to delight in rather than endure. The Dark-eyed Junko found in every province and as easily identified by the general public as the Chickadee is commonly called the Snow Bird because of its sudden appearance around American winter feeding stations from October to March. Then it suddenly disappears. Remind you of an internationally known trait of Canadians? Observe the Canadian Snowbird Association, Snowbird Vacations, Snowbird Lifestyles, Canadian Snowbird Destinations and then there is the Internationally acclaimed aerial acrobatic team aka "The Snowbirds" from 431 Air Demonstration Squadron of the Canadian Forces flying aerial magic since 1971 to audiences of 3 million spectators, who are a symbol of national pride. No other Canadian bird has the distinction of a song written by a Canadian, Gene MacLellan, sang by a Canadian, Anne Murray, who met at CBC, achieved #1 status on both the Canadian adult contemporary and country charts at the same time (1970). It was also the first American Gold Record ever awarded to a Canadian solo female artist. Once again it becomes a bird whose far reaching renown has made it a truly recognizable Canadian icon. The bird is monogamous, mating for life which represents the core values of Canadian family. They DEFEND their territory vigourously during nesting and breeding seasons which also exalts the Canadian affirmation in the National Anthem. And best of all, mating rituals. A male will approach a female with a bow and wing quiver. A real gentleman. It is followed by an elegant tail fanning. The female will allow herself to be pursued by a chase and will then PICK the male SHE decides is best. This exemplifies the Canadian Charter of Rights and Freedoms. I'm voting for this dear bird not only because I admire and love them but because the Dark-eyes junco was my Mother's absolute favourite. I wish she were here today to add her vote. A beautiful little bird that nests in my window box every summer. Fondly known as the snow bird the dark eyed junco is seen as far north as the Arctic regions in summer. Juncos are very Canadian - polite, tough & love a song. They are chubby & cute and extremely entertaining! Beautiful, tough, understated - just like the country! J,aime tellemtn ces petites boules de plumes, au printemps!!!! Dark-eyed Junco - aka Snowbird. It may be pop culture, but when you say "Snowbird", people around the world know you are talking about Canadians. No other bird automatically makes people think about Canada, other than the Canada Goose, and "goose" is one of those things that can easily be made fun of in a derogatory way. Snowbirds are related to many other North American species, which is typical of Canadians. It is just one cool bird. 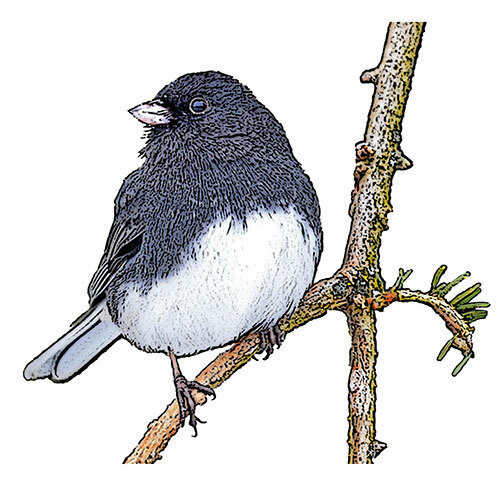 Winter or summer the dark eyes junco bobs around my yard delighting me and my cats who sit on the windowsill with tails twitching hoping one will come closer to the window.It's bright and lively personality makes it an excellent representative of Canada. The junco is a faithful little Canadian bird that stays all through the winter and shares the cold, snow and triumph of spring with us. It doesn't complain, politely without fuss holds its own against its cousin sparrows, and delights us at our bird feeder week after week. It forages for food under the snow with a gentle shuffle, never daunted, coming back again and again. It cleans up the ground of the spilled seed from other species. Since the junco appears in all areas of Canada it seems an appropriate symbol of commitment to our country and patience with our winters. Unlike the chickadee that flits and hops, rushes in for food and is gone again, the junco is steady, visits and stays a while, patiently eating the bird seed and sharing it when other hungry species come around. The lovely slate gray back and wings blend beautifully with the surrounding trees where it nests close to the feeder, ever grateful for the help through the winter. The birds' colours are calming, and its manner impeccable. Just what some characterize Canadians to be. Lorsque j'ai vu ce bel oiseau pour la première fois sous une de mes mangeoires il m'a immédiatement plut grâce à son petit bedon gris et tout rond. C'était le seul qui tournait les feuilles mortes sur le sol pour y chercher de la nourriture. C'est toujours un plaisir lorsqu'il nous fait une petite visite. Nous avons une mangeoire et les oiseaux abondent tels que mésange, cardinal, geai bleu et le junco qui me plaît plus particulièrement, surtout en surface sur la neige blanche. Le Junco ardoisé est bien d'ici puisqu'y passe l'hiver. Une petite boule de chaleur. Discret par sa livrée bien découpée grise et blanche. Facilement repérable quand il voltige, laissant voir, telles des étoiles, ses petites plumes blanches de chaque coté de la queue. C'est mon oiseau préféré. The Dark-eye Junco is found in so many areas of Canada makes it a good choice. They fun birds to watch and especially for people that have feeders. The Dark-eyed junco was one of the birds that we have spotted in our backyard. By participating in Project FeederWatch over the years, we have paid attention to birds in our backyard, and learned to identify the different species. We also worked to add more native plants and bushes, and to landscape to promote more native wildlife. 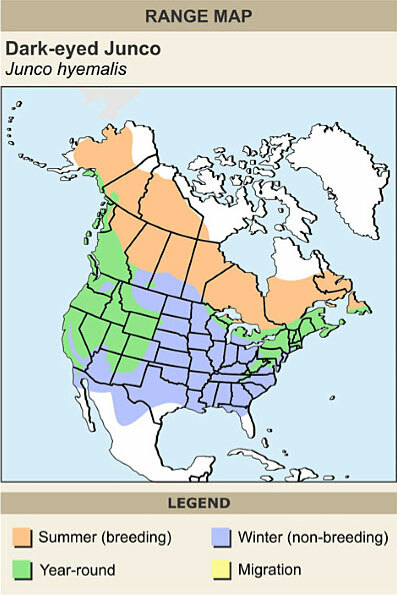 We noticed that the black-eyed juncos would visit our yard for a few weeks in the spring and fall as they would migrate through Southwestern Ontario. Last year we noticed that a few of them stayed through the winter and this year they have stayed again. The dark-eyed junco is a bird species that is found in every province and territory in Canada, and having it as our national bird could encourage people to look for it in their area. People across Canada could be encouraged to improve their yards to help native species. It could promote awareness and action. j'espère qu'il n'est pas l'emblème d'aucune province. Et cet oiseau est au pays les 4 saisons. Mais mon coup de cœur restera toujours le mésange et/ou le merle d'Amérique. Alors bonne chance au junco. c'est un oiseau représentatif car il est partout au Canada et il,est facile à reconnaître. Il s'approche facilement des mangeoires en toute saison. Charmant petit oiseau qui passe beaucoup de temps avec nous, en transition vers d'autres parties de notre pays. C'est çe caractère de trait d'union canadien qui me plaît bien. J'aime beaucoup ce petit oiseau que je trouve beau et rapide. This little bird is seen across the country, is feisty (which Canadians are beneath the surface) and beautiful. Nothing to add to previous commentaries. I agree with preceding writers. The Junco always welcomes winter to our Niagara Peninsula community. Like most Canadians it tends to keep its feet on the ground, is very cooperative with the other birds at the feeder and is not a flashy dresser. In fact, I oftern think the Junco is dressed in an understated tuxedo. The dark-eyed junco is elegant, restrained, beautifully monochromatic with deep grey plumage above, setting off pure white breast feathers that reflect the snow. It's when the snow flies here in Southern Ontario that the juncos arrive, they're our winter companions - shy birds, quick to take off, but that's when they display their most striking feature, with a flash of brilliant white tail feathers disappearing into the nearest tree. In the summer, they depart for the boreal forest - making them the perfect bird for our country, connecting North and South, but always one of us. This bird ranges throughout Canada in every environment and is also the most prolific. Since the criteria for this 'contest' are supposed to be birds that "can represent this nation of forest, prairie grassland, Arctic and sub-Arctic, maritime and wetland, agricultural and urban", most of the others put forth are patently red herrings. Much as I love the chickadee, the dark-eyed junco is the one that lives in my garden year round. I see many birds visiting my feeders, including downy woodpeckers, cedar waxwings, finches, large variegated thrushes and several varieties of hummingbirds and sparrows, but the one constant is the junco who never misses a day, so on the basis of sheer numbers and familiarity, the junco gets my vote. The thumbnail of the bird is fat and fluffy, cute little bird. A national bird should be ubiquitous. It should capture something of the national character both human and natural. I think juncos do. They are found in urban, rural and remote areas. They are quiet and hardworking. They are not flashy but exhibit a quiet get-it-done attitude.